Located below the waist, the sacroiliac (SI) joints connect the lower part of the spine to the pelvis. 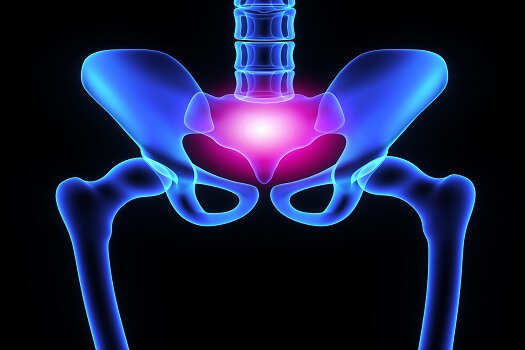 Aging, pregnancy, and even previous spine surgery in the same area can contribute to a sacroiliac joint dysfunction that causes pain in the lower back or legs. If you have SI joints that are inflamed (sacroiliitis), not moving properly, or supporting ligaments and muscles that are irritated, you’re likely searching for ways to ease your discomfort. Options are discussed below. When you first feel what may be SI joint pain, rest the area for a few days as much as possible. Take a break from your normal activities, but don’t overdo it with rest, since supporting muscles may become weak, which could place more stress on an already weakened or irritated joint. Applying ice to your lower back and pelvic area may soothe sore muscles. Heat can be applied afterward to increase circulation. Moderate SI joint pain may respond well to over-the-counter anti-inflammatory drugs such as ibuprofen and naproxen sodium. Acetaminophen and other over-the-counter pain meds may help as well. For times when pain is severe, your doctor may prescribe muscle relaxants, prescription NSAIDs, or narcotic painkillers (opioids). However, be aware that medications only mask pain temporarily, and certain ones—such as opioids—aren’t meant to be used long-term. If initial conservative treatments aren’t effective, SI joint injections may be suggested. Administered directly to the affected area, the shots contain a combination of a local anesthetic and an anti-inflammatory medication, usually a corticosteroid. If an injection is being given to determine if an SI joint is really the source of your pain, your Santa Monica spine surgeon might use only an anesthetic to see if you experience relief. SI joint pain stemming from an inflammation-based source of rheumatoid arthritis (RA) sometimes leads to high levels of tumor necrosis factor (TNF), a type of messenger protein produced by white blood cells when inflammation is present. Usually given by injection or IV, TNF inhibitors block this particular factor, possibly slowing the progression of the underlying condition that’s causing SI joint pain. Electrical stimulation works by implanting a small device into the sacrum to block nerve signals and relieve pain. Patients are usually able to control how much stimulation is delivered. With radiofrequency ablation, affected nerves are burned with a small needle heated by radiofrequency waves to disrupt pain signals. If you’re not getting sufficient relief from non-surgical treatments, an SI joint fusion may be performed. During the minimally invasive procedure, the sacrum and hip bone are fused together with graft material and internal hardware. The purpose of this option is to decrease motion and minimize joint irritation. It may take about six months to fully recover, since it takes time for the fusion to form. Because symptoms associated with SI joint pain can also be a sign of sciatica or lumbar disc herniation that may require lumbar disc replacement, Santa Monica residents should make sure to get a proper diagnosis when they have this type of discomfort. Diagnosis typically involves an interpretation of results from a physical exam and image tests coupled with your medical history and a detailed description of the symptoms experienced. Sacroiliac pain is a common occurrence, and if you use some or all of the methods above, you should be able to ease your discomfort. If you continue to experience pain for a long period or the pain becomes especially severe, don’t wait to contact a spine specialist. The spinal health experts at The Spine Institute can diagnose and treat your condition so you’re back to your normal routine as soon as possible. Call one of our friendly representatives today at 310-828-7757 and schedule a consultation.